How Do You Grade a Bike-Share System? Bike-share has exploded in the last decade — and in North America, just in the last few years. What started as a shaky concept in Amsterdam in the 1960s has matured into a viable transit option worldwide, with 600 systems offering more than 600,000 bikes. The nonprofit Institute for Transportation and Development Policy (ITDP) is taking stock. Most major cities, if they haven’t already installed bike-share systems, are at least exploring them – and there are a lot of different models to follow, especially as “fourth-generation” bike-share technology develops, like stationless systems. 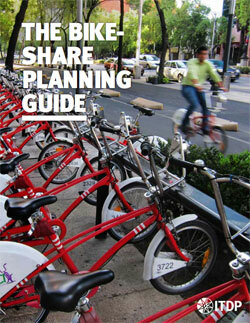 “Right now is this exciting time where systems are growing and experimenting,” said Colin Hughes, one of the authors of ITDP’s newly released Bike Share Planning Guide. But until now, Hughes said, “there hasn’t been an objective language” to measure bike-share systems. The ITDP report fills the void with two major yardsticks: the average number of daily trips per bike (four to eight is deemed optimal), and the average daily trips per resident in the coverage area (ideally one trip per 20 to 40 residents). Based on these metrics, seven cities rose to the top of the bike-share heap, in order: Barcelona, Lyon, New York City, Rio de Janeiro, Paris, Montreal and Mexico City. But the new guidebook is less about ranking cities and more about sharing best practices, culled from 25 major bike-share networks across the world. “Our objective is to get more [systems] developed and to make them better,” said Hughes. The infographic below summarizes the key ingredients of a successful bike-share, such as a recommended 300-meter distance between stations and a minimum coverage area of 10 square kilometers (a little less than four square miles). The report also guides planners through the nitty-gritty implementation process, from feasibility studies and designs to financial plans. There’s a whole range of decisions to be made along the way. Should stations be moveable or permanent? What’s the government’s role? How do you monitor the performance of a private operator? A major question is how best to achieve financial stability. The report notes that bike-share subscription and usage fees offer stable revenue but rarely cover total operating costs. (Though Capital Bikeshare in Washington, DC, comes close, with a 97 percent recovery ratio.) While most systems rely on at least some public funding to cover the gap, a few new models — like New York’s Citi Bike — do not, and should be interesting tests for the all-private funding route. Across the board, there’s a lot of experimentation going on in the bike-sharing world. According to the report, most systems right now are considered “third-generation” — meaning they use communications technology to monitor stations and users. But there’s a new generation ahead, testing out features like electric-assist bikes, moveable stations, and universal cards that integrate bike-share with other transit modes. For those following the stats, today and days like it are a tough test for Citibike. Not much sunlight generally, plus overcast. I wonder how it fared. Portland's program will offer a mix of tandems, hand-cycles, and three-wheeled bikes.